Plant tissues. Sclerenchyma fibers. Atlas of plant and animal tissues. Technique: paraffine embedding, section stained with Alcian blue / safranin. Classification of sclerenchyma fibers is based on their location because it is difficult to make subtypes based on cell features, i.e. they show a similar morphology. 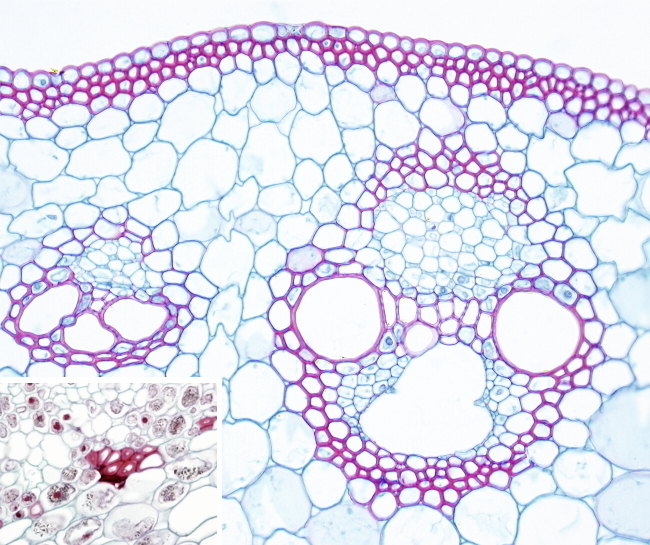 Sclerenchyma fibers can be found below the epidermis of monocotyledons, organized in two or three layers of cells. They are known as cortical fibers. Perivascular sclerenchyma fibers are found protecting vascular bundles. Xylary sclerenchyma fibers are components of the primary xylem.